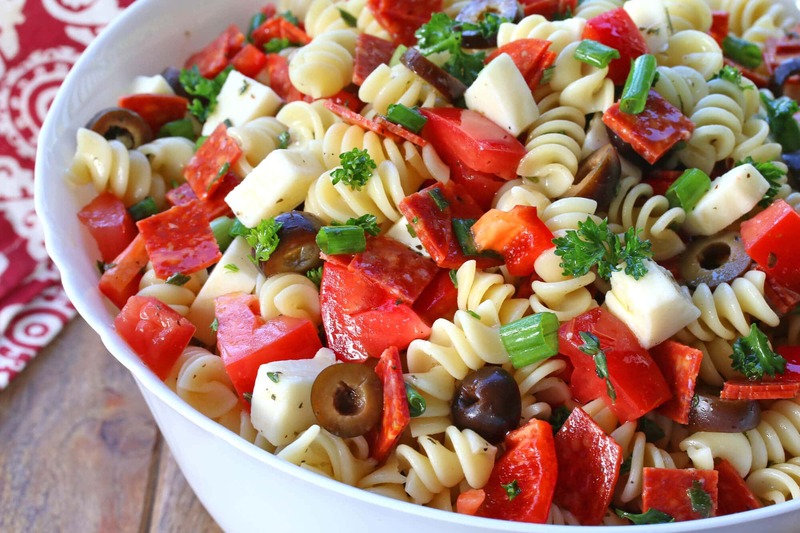 You just can’t have too many pasta salad recipes. They’re the perfect accompaniment to any BBQ, picnic or potluck so it’s always nice to have a variety to choose from. I had a chunk of mozzarella and some pepperoni left over from a pizza I made the other day and needed a pasta salad to take with me for an event and so I thought why not combine the two? 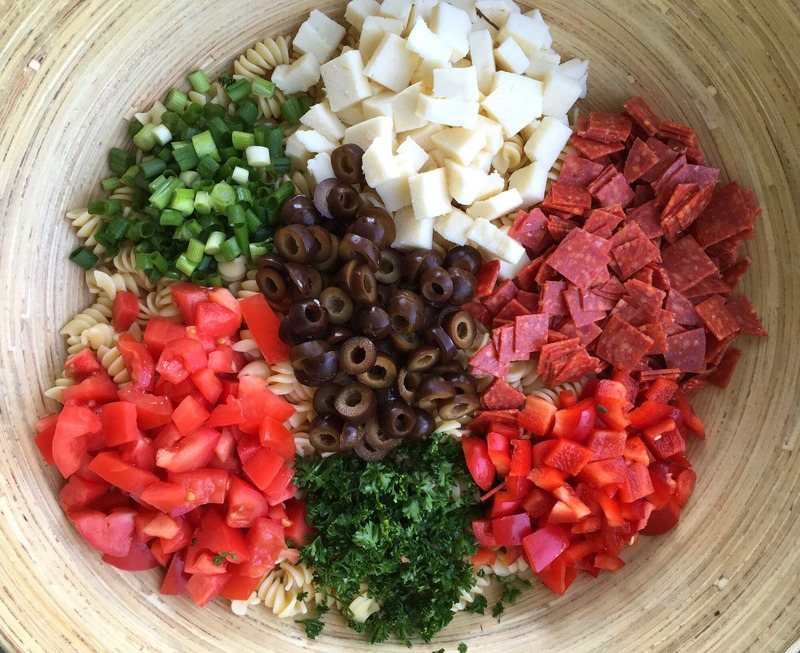 So here it is: Your favorite pizza toppings in a pasta salad! We’ve got cheese, pepperoni, bell peppers, tomatoes and onions folded with pasta and tossed with a homemade Italian dressing. It makes for a colorful presentation and tastes delicious! Placed the cooked, drained and fully cooled pasta in a large mixing bowl. Add all the remaining pasta salad ingredients. Prepare the vinaigrette by placing all the ingredients in a bowl or shaker and whisking/shaking until emulsified. Pour the vinaigrette over the pasta salad and stir everything until combined and the pasta salad is coated with the vinaigrette. Cover and refrigerate for at least 3 hours or overnight before serving and then stir it again. 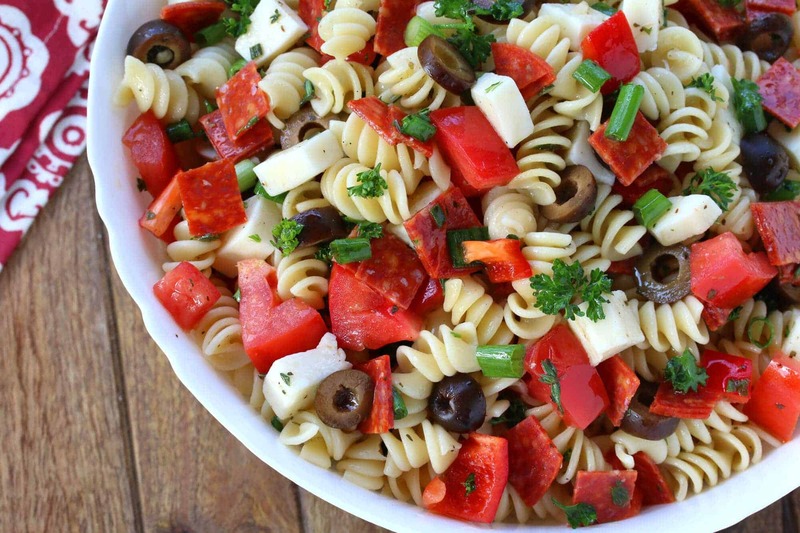 All your favorite pizza toppings in pasta salad form! Placed the pasta in a large mixing bowl. Add all the remaining pasta salad ingredients. Prepare the Italian dressing by placing all the ingredients in a bowl or shaker and whisking/shaking until emulsified. 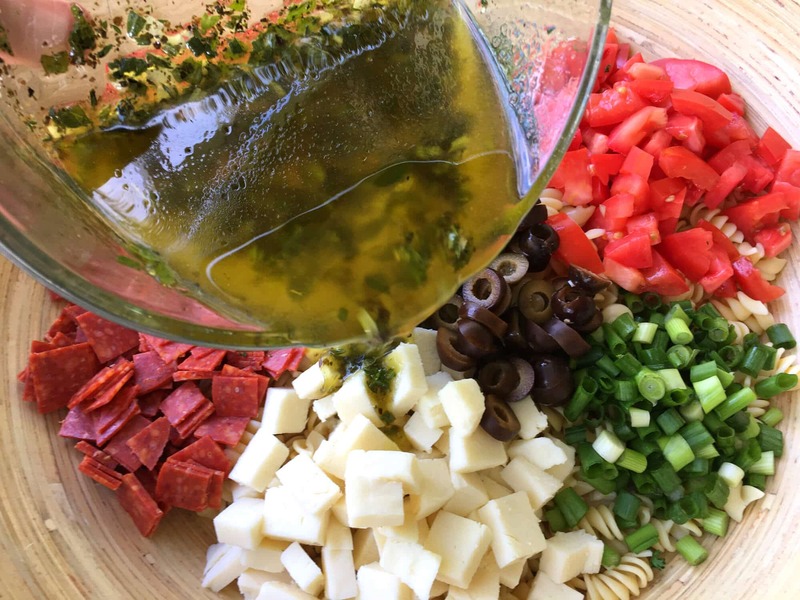 Pour the vinaigrette over the pasta salad and stir everything until combined and the pasta salad is coated with the vinaigrette. Such a colorful, refreshing salad loaded with tasty mix-ins! 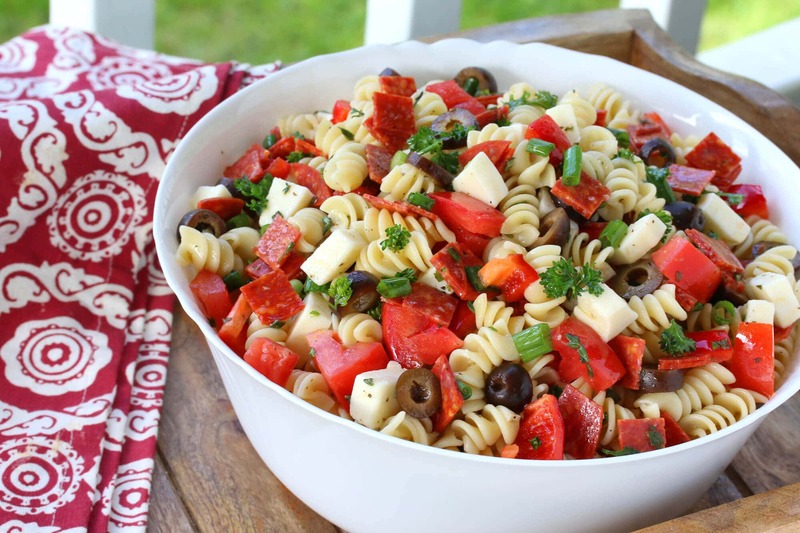 I’m in love with this pizza pasta salad! Loving all the colors and flavors in this dish! I can’t wait to try this for a picnic. I am always looking for new and different pasta salads to take to cookouts during the summer. This is a winner! You just can’t go wrong with this list of ingredients! Perfect summer BBQ side! I agree that you can’t have too many pasta salads! This would be welcome at any backyard bbq or picnic. My kind of pasta salad! Love how you added pepperoni to it! 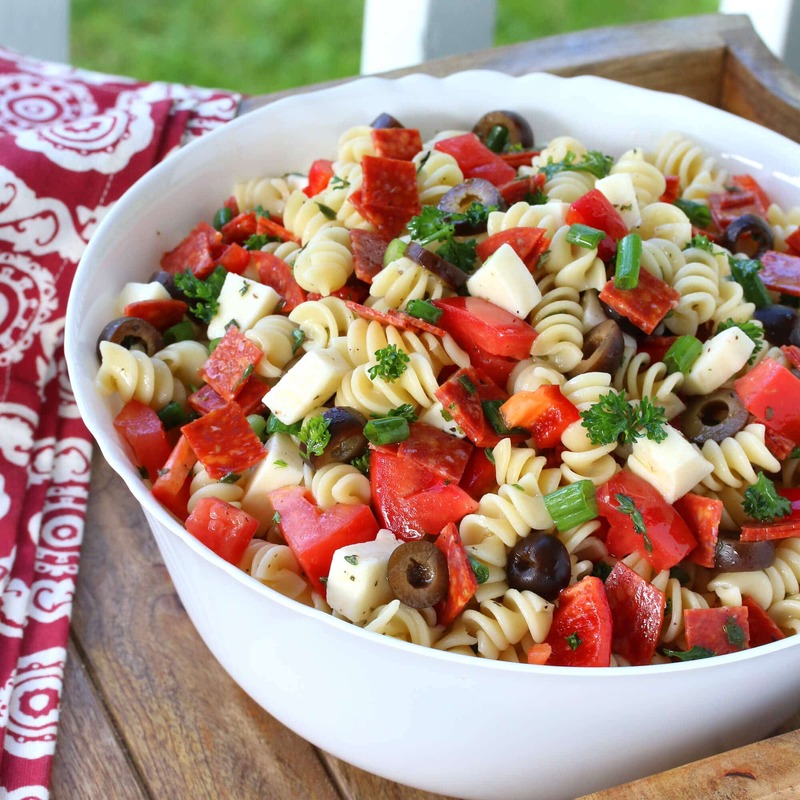 Now THIS pasta salad is really a treat! Loving the twist with pepperoni!